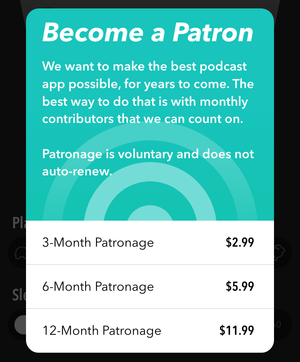 The makers of Castro, a popular podcasting app, are throwing their hat in the patronage ring with their new 1.5 release. The app is now free, with an option to pay $1 per month as a nonrecurring 3-month, 6-month, or 12-month contribution to the developers at Supertop. The in-app purchase comes with no extra features.